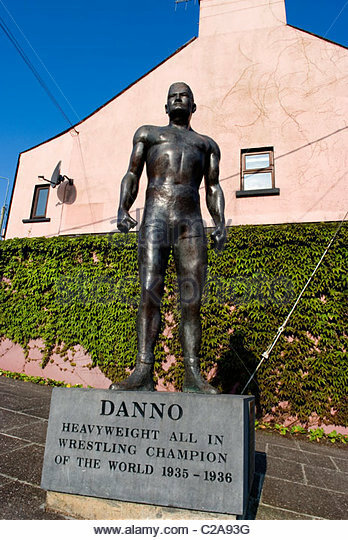 * For a time in the mid-1930s, Danno O'Mahony was arguably the most famous Irishman in the world. And he was certainly one of the few West Cork men who made his living in tights. Danno had a vast army of admirers. And a legion of sworn enemies. Their black ranks included Ed "Strangler" Lewis, Steve "Crusher" Casey, Bronko "The Red Menace" Nagurski, Chief Little Wolf and The Infamous Flying Dusek Brothers. All had sworn to defeat Danno. Some reckoned they did. But while the big man was often floored, Danno always rose from the canvas, puffed out his massive chest, danced forward and executed his killer move - the Irish Whip. He was one of the biggest stars of the Golden Age of Pro-Wrestling - a time when Grunt n'Grapple was as big as boxing and taken (almost) as seriously. It was the great American Blue-Collar past-time - and Danno, the handsome farm-boy from West Cork - was one of it's biggest names. 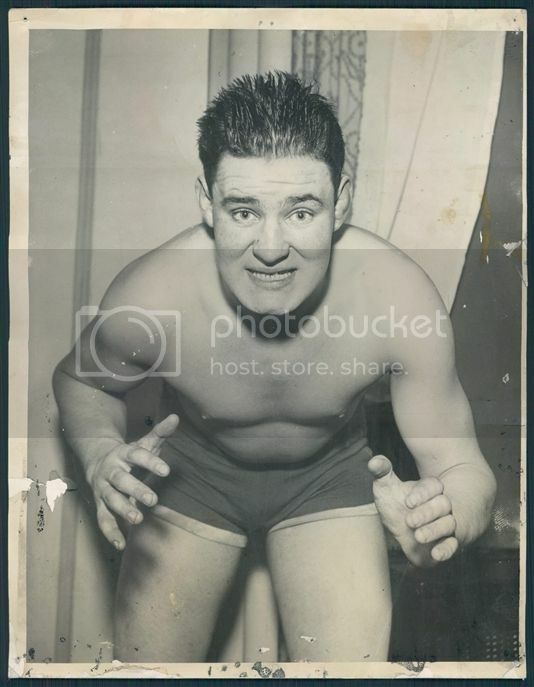 On April 26, 1935, just months after Danno had swapped an Irish army camp for the life of a sports-star in the US, he faced Ed "Strangler" Lewis at the Boston Garden in front of 20,000 wildly cheering fans. Danno won the first fall after twenty minutes of grunting, groaning and grappling with his signature Irish Whip. But Strangler, in a red rage, rose and threw Danno from the ring. Ten Boston-Irish cops tried to stop Danno, blood streaming from a cut above his eyes, from getting back in to murder the Strangler. The Irishman hurled them aside, leapt over the ropes and executed a fall so hard, the Strangler was laid out unconscious on the canvas. Danno was pro-Wrestling's World Heavyweight Champ. The Boston Globe called it a "thrilling match with a great climax". Danno sailed back to his native shore, arriving in Cobh on a transatlantic liner to a huge reception, caught on newsreel and shown around the world. Danno was born on a farm outside the West Cork village of Ballydehob in September, 1912. His father, Big Dan, was (as the name might suggest) a mountain of a man, 6'5'' and almost as wide, a famous sportsman in the locality. Young Danno left school at 13, worked on the family farm and then joined the Irish Army. He quickly became a star athlete, setting several national records in strength events, including an Army record for the hammer-throw that wouldn't be broken until 1990. Professional wrestling was a huge sport at the time, in the US but also in Europe. When the legendary promoter Paul Bowser decided he needed a new star - and an Irish one to get in the huge, East Coast Irish-American crowds - he approached the famous Irish Olympian (and 1928 Hammer Gold Medallist) Pat O'Callaghan with an offer. O'Callaghan, a qualified doctor, turned him down. But he did recommend a fellow Corkman, a private in the Irish Army who could "fit the bill", the young giant Danno. Bowser used his connections with Boston Irish politicians to get Danno "excused" from the Irish Army (it's said the Boston Police chief wrote a personal letter to the Irish Minister for Defence, Frank Aitken) and the Cork kid was soon on a boat heading for London, to actually learn how to wrestle with one of Bowser's English contacts.. When Bowser finally met with Danno in New York, he realised that in the huge, handsome Irishman with the charismatic smile, he had hit gold. On January 2, 1935, after a rough Atlantic crossing and a smoother ride from New York to Boston in a private plane, the kid who had recently been an Irish Army private on eight quid a week signed a five year, pro-Wrestling contract said to be worth $100,000 dollars. The West Cork boy was living in one of Boston's finest hotels, eating steaks and training every day, ready for his big professional debut in the Boston Garden. Pro-wrestling was then, as it is now, "sport entertainment".Wrestlers had clearly defined personae, they were mostly either Heroes or Heels, they represented immigrant groups or crude racial stereotypes. Danno O'Mahoney (the promoters added an "e" to his surname) would be a champion of the blue-collar East Coast Irish, the Gorgeous Gael, the kind of wrestler you could take home to meet your mother. He was wildly successful over a short period of time, regularly wrestling in front of crowds of 20,000 or more. It was the first Golden Age of Pro Wrestling, when the biggest stars were household names across Europe and the US and newsreel cameras brought the latest big bouts into the cinemas. One of his first bouts, against the hated "Heel" Ernie Dusek at the Boston Garden on Jan 5 1935 drew a crowd of 20,000. The local papers said "at least of 14,000 of these were screaming Irishmen, out to support their boy". Danno seemed to freeze at first, hardly surprising given that a few months earlier he had been a private on a remote Irish Army camp who had never really wrestled in his life. However, after a few hesitant rounds, Danno gave the Irish crowd what they wanted - using his patented "finishing move" the Irish Whip. This move, still seen in pro-wrestling today, involves catching your opponent by his outstretched arm and using his own momentum to "whip" him into the ropes, ready to be clotheslined on the rebound. Ernie Dusek got laid out. Which was too much for his cornerman and brother Rudy, who jumped into the ring and attacked Danno. Then Ernie got off the canvass and joined his brother. Danno responded by "punching everything that moved" including the ref (Sam Smith) and the Boston police who were usually on good money from the promoters and could always be guaranteed to join in the fun/mayhem. "Danno threw punches at the police, as the crowd roared their approval" was how one local paper reported it. Danno was eventually crowned champ and the huge crowd went home happy. It was Friday night entertainment, they got to see the giant Irish lad lay into the cops and beat the Duseks. Boston had a new hero. Danno had a brief but glittering career, was World Champion several times - but in pro-Wrestling, such titles were always contested by rival organisations and the behind the scenes strokes and fixing meant that careers could be made and destroyed very quickly. Perhaps his greatest occasion was a title unification fight with rival Ed Don George on July 30th, 1935, a match that drew over 40,000 fans (including Massachusetts Gov James M Curley) to the Braves Field Baseball Park. The gate was reported to be $60,000 dollars. However, the bout had a very poor finish, the crowd were unhappy and the press started to turn on the promoters who were so obviously fixing fights and carving out monopolies. Danno also had visa problems which affected his career. He married, moved to Los Angeles, opened a restaurant and then joined the US Army during WWII. After the war, he decided to move back to Ireland and his native West Cork for good. But in 1950, at the age of just 38, and only a couple of months after returning home, Danno O'Mahony died from injuries sustained in a car crash. He was hugely, briefly famous across the US and Ireland. Today, he is still remembered in his home town, where there is a statue of him standing at the crossroads as you drive in from the Cork City side. From West Cork fields to performing in front of tens of thousands across the US, Danno O'Mahony had pro-Wrestling to thank for a life less ordinary. Hi. My maternal grandfather was Dennis Driscoll. Danno stayed with my mother's family in Nahant MA, growing up, whenever he had matches in Boston. I grew up hearing tales of "Uncle Danno." I traveled to Ireland in 1997 and was told that Danno's brother was still alive in a rest home in Clonakilty, but we were not able to go there. From the Driscolls of Boston and Nahant, well done Uncle Danno!